Drum or other percussion instrument; smart board or marker and poster board or paper to list names of body parts. Before starting this unit, see if the classroom teacher, librarian, or a parent would be interested in reading one or more of these stories to the class. Stories about strong, courageous children, such as Brave Irene by William Steig, John Henry by Julius Lester; The Boy Who Held Back the Sea retold by T. Locker, The Emperor and the Kite by Jane Yolen, or The Lighthouse Keeper’s Daughter by Arielle North Olson. 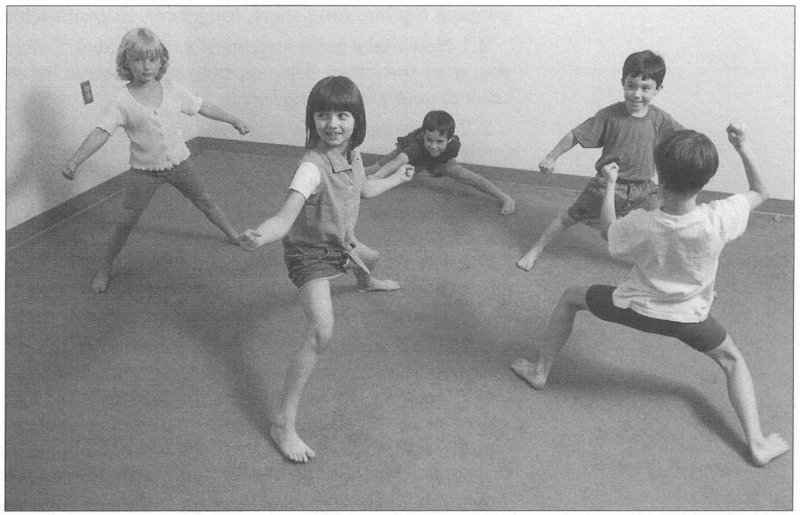 Work cooperatively in a dance situation by listening and responding appropriately to instructions, especially signals to start and stop moving. Play rainbow tornado to warm up.Rainbow/Tornado Talk to the children about Tornados, Hurricanes, or really strong storms. Talk about how they create a big mess and sometimes after a big storm things are thrown all over. When you mess up the gym during mess-up/Clean-up that it is like a tornado came into the gym. Have a discussion about rainbows and that they come out after a storm and everything looks fresh and clean! That is how the gym looks after we “Clean-up”!Explain to the children they are going to play a game called Rainbow/Tornado. Some people will be the rainbow cleaning up, the other people are the tornado, messing up, at the same time! Reassure the children they will get to play both parts. Ask the children to find a friend and stand together knee to knee. Ask one partner to stand and one to stay sitting. Designate the one standing to be a tornado and one sitting to be a rainbow. After a few minutes, let the pairs of children switch being tornadoes and rainbows.Teaching Tip Establish and use a number of different ways to divide the class into pairs or small groups. Consider height, age, closest in proximity, hair color or length, clothing colors, equipment colors, etc. Have the tornadoes travel different ways to bring the garbage into the boundaries. Have the rainbows color match the garbage. Kids making body parts important! Let’s Travel to the Drum! Tap a steady beat on a drum or other percussion instrument. Everyone look for and move into the empty spaces as I tap my drum and be ready to stop quickly. Ready? Travel! Move into empty spaces-and stop! Do you see any places that are empty? Look hard for empty, open spaces as you travel so when we stop next time, all the spaces will be filled. Start and stop children frequently. This time when we stop, show me how important your body is by holding very still. Don’t move a muscle. You know where every body part is in space! Again, ‘travel, travel, travel … and stop.’ Repeat several times. Tighten your leg muscles-hold very still! This time when you stop, lift up or reach out with your elbow and hold it still. Show it is the most important body part in the world! Ready and ‘travel, travel … and stop.’ Reach with an elbow. Suggest body parts to emphasize, then let children choose parts. Head, knees, hip, foot, hand, shoulder, back, stomach, etc. Every time we stop, make a different body part important. Reach out into space with it. Lift up, or poke out a new body part to show the world!What are some different ways to make body parts important? One way is to look at it. Focus your eyes and face on that body part. Make it feel important.Let’s travel again, and when you hear ‘and stop,’ freeze and show us which body part is the important one. Look at it! Repeat several times. Ask for more ideas and follow the children’s lead. Let’s make a word list. Who’s ready to name an important body part? Print children’s responses in large, lower case letters on poster board or make a computer printout. Along with photos of the children in action, the list makes a great bulletin board display. Provide a variety of rhythmic accompaniment on the drum or play music. Divide the class into two groups. Accompany with percussion or music. This half of the class show us your dances by traveling and pausing, making a different body part important every time you stop. Those of us in the audience get ready to name the important body parts you see. ‘Travel, travel, travel … and stop.’ What body part is [Ashley] making important? Exactly! See her left knee lifted high? She is looking at it, too! Let’s all try again. ‘Travel, travel … and stop.’ What body part is [Freddie] showing the world? How about [Nan? Delphia?] Pause frequently to focus attention on different children, naming important body parts. Switch groups after several tries. Choose 3 stretches to do with the class. After stretching ask the children to describe the different body parts they used and how they made them important.